Tow Professional is a comprehensive publication for the towing and recovery market. 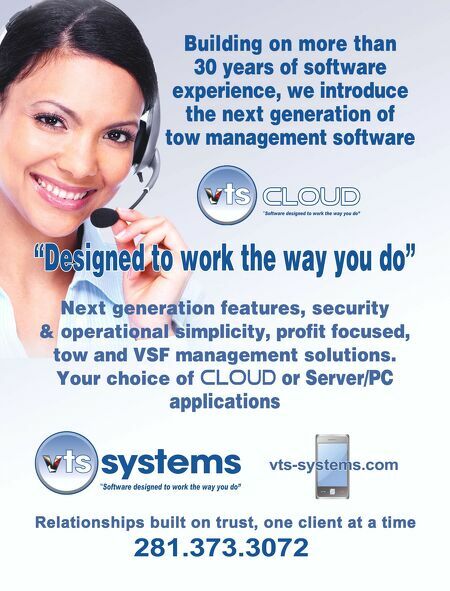 It is mailed directly to more than 29,000 decision makers including owners, presidents, CEO's and principals of towing companies throughout the United States. 6 Tow Professional | Volume 5 • Issue 1 | www.towprofessional.com I N D U S T RY NEWS T O W I N G & R E C O V E R Y T O W I N G & R E C O V E R Y J err-Dan introduces the Tow Performance Calculator. 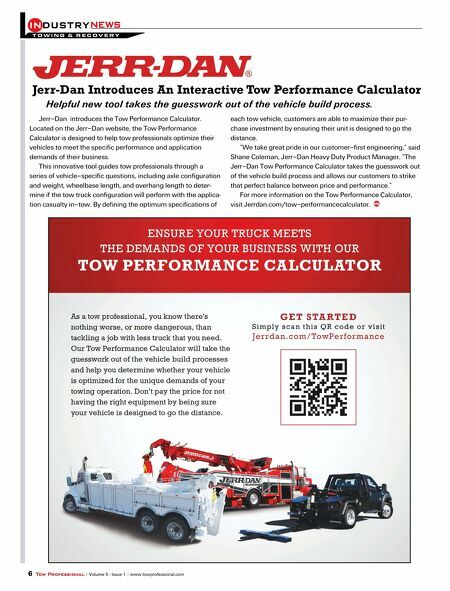 Located on the Jerr-Dan website, the Tow Performance Calculator is designed to help tow professionals optimize their vehicles to meet the specific performance and application demands of their business. This innovative tool guides tow professionals through a series of vehicle-specific questions, including axle configuration and weight, wheelbase length, and overhang length to deter- mine if the tow truck configuration will perform with the applica- tion casualty in-tow. By defining the optimum specifications of e ach tow vehicle, customers are able to maximize their pur- chase investment by ensuring their unit is designed to go the distance. "We take great pride in our customer-first engineering," said Shane Coleman, Jerr-Dan Heavy Duty Product Manager. "The Jerr-Dan Tow Performance Calculator takes the guesswork out of the vehicle build process and allows our customers to strike that perfect balance between price and performance." For more information on the Tow Performance Calculator, visit Jerrdan.com/tow-performancecalculator. Jerr-Dan Introduces An Interactive Tow Performance Calculator Helpful new tool takes the guesswork out of the vehicle build process.